Director Damien Chazelle and cast member Emma Stone pose at the premiere of "La La Land" during AFI FEST in Hollywood, Calif., Nov. 15, 2016. La La Land, a modern-day musical love story of two struggling artists in Los Angeles, cemented its Hollywood awards season front-runner status on Thursday by simultaneously leading the nominees for Critics' Choice Awards and being named best picture by New York film critics. La La Land scored 12 Critics Choice nominations, including best picture, best actress for Emma Stone, best actor for Ryan Gosling and best director and screenplay for Damien Chazelle. Sci-fi drama Arrival and independent drama Moonlight both landed 10 nominations each, including in the best picture race, as well as best director for Denis Villeneuve and Barry Jenkins respectively. The New York Film Critics Awards, a separate critics organization, named its 2016 winners on Thursday, with La La Land taking best picture. Jenkins was named best director. The Critics' Choice Awards are chosen by the 300-plus members of the Broadcast Film Critics Association (BFCA). Winners will be announced at a televised ceremony held in Santa Monica, California, on December 11. Both the New York Film Critics and BFCA members rarely cross over into the Academy of Motion Picture Arts and Sciences and industry guilds that pick nominees and winners for the majority of Hollywood's awards shows, but the critics' awards help to build buzz for potential Oscar front-runners. 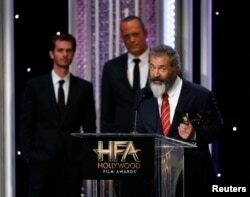 Director Mel Gibson accepts the Hollywood Director Award for "Hacksaw Ridge" as cast members Andrew Garfield, left, and Vince Vaughn look on at the Hollywood Film Awards in Beverly Hills, Calif., Nov. 6, 2016. Also in the Critics Choice best picture race is Denzel Washington's Fences, Mel Gibson's war drama Hacksaw Ridge, crime thriller Hell or High Water, adoption tale Lion, Loving, about an interracial married couple, family grief drama Manchester by the Sea, and Clint Eastwood's Sully. Stone will be contending for best actress opposite Amy Adams for Arrival, Natalie Portman for Jackie, Ruth Negga for Loving, Annette Bening for 20th Century Women and Isabelle Huppert for Elle. Gosling will face Casey Affleck for Manchester by the Sea, Washington for Fences, Tom Hanks for Sully, Joel Edgerton for Loving and Andrew Garfield for Hacksaw Ridge in the best actor race. In the action movie categories, superhero films Captain America: Civil War, Deadpool and Doctor Strange will compete against Jason Bourne and Hacksaw Ridge.